You know those background-heavy OAFEnet reviews we do, where you learn all about the toy's place in its line and its context in the wider spread of pop culture? This won't be one of those. An upstart officer thrown into the middle of a war zone, Lieutenant Kendra Shaw survives the Cylon attack thanks to Admiral Cain's quick thinking and her own discovery that Cylons are now capable of taking human form. Because aside from the obvious - that she's a kind of more martial Hoshi from Enterprise - I haven't got a clue who Kendra Shaw is. I think the last time I watched Battlestar Galactica was season... three, possibly? When did they rig up a boxing ring on the ship? Around then. It's not that I consider it lacking in any way - it's arguably one of the most finely crafted TV shows ever - it's just that the longer it went on, the more I found myself lacking any kind of affection for it, until I just stopped caring enough to tune in, let alone seek out Razor (I haven't even looked up the plot to find out if Kendra's dead or not). It's like socializing, really: if you could round up a half-dozen winners of the Nobel Peace Prize you'd have some pretty exemplary human beings, but I'd still rather hang around with my mates. I do own the Kendra Shaw action figure, so at least this part of the review will be useful to someone, possibly. The Battlestar line as a whole is kind of the next generation to the Stargate action figures - collector-oriented, with a high prioritisation on looks and accuracy rather than play value, but Diamond Select haven't been sitting on their hands, and Kendra and her contemporaries are turning into a pretty good synthesis of play and display. Her face seems decent enough by action figure standards - I wouldn't say exceptional, based on the images I've Googled up, but there's a fair resemblance there, especially in the slightly full cheeks and small jaw. Her facial features are painted very well, with lots of fine detail, and her hair boasts a very sharp sculpt, with a three-layer ponytail pulled sharply back from the hairline, and a restrained brown drybrush pass keeping it from looking plain without pushing too far into brunette territory. Kendra stands 6¾" tall, and her uniform - Colonial Navy blues, or whatever - is an impressive sculpt, with plenty of subtle folds and creases in the fabric to convey a low-tech, lived-in feel, but still sleek and formal in its overall lines. The double-breasted jacket is realised well, with a clean sky blue trim line coming down from the collar (the cuffs get the trim too), and nice and shiny brass buttons holding it closed. She's also sporting a little utility belt, with a holster for her pistol and pouches of various shapes and sizes (obviously custom-designed for specific equipment) around its length, plus a brass paint app to pick out the buckle - which works, incidentally, although it's a press stud rather than a proper clasp. Articulation is a big asset to this figure, as is the case with many Battlestar figures (except Red Dress Six, who lost out majorly). Kendra has a balljoint neck, with her hair sitting close to her back, but not so close that she can't turn her head a useful amount. There are recessed balljoint shoulders, swivel biceps, pin elbows and swivel wrists, and below a swivel waist she's got swivel/pin hips, swivels above the knees, pin knees, and swivel ankles. The ankles are the only sore point, with the trousers sculpted to sit over the tops of her shoes limiting their turning range quite severely. Nonetheless for a display-quality figure, which this certainly is, she's exceptionally mobile - she's only the ankles and a sternum pin short of my DCU4 Wonder Woman, and Kendra's joints are far less visible. So she's a fine toy, but she's also got plenty of toys of her own to play with - although not having seen Razor, some of them are a bit of a mystery to me. 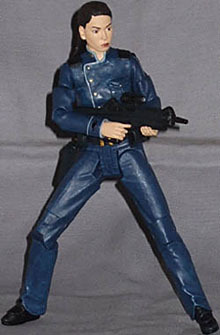 Besides the removable pistol in her holster (and the holster itself) she's got an automatic rifle, with silver dotting the lenses of the scope and spotlight on it, and a flick knife for when she runs out of ammo. 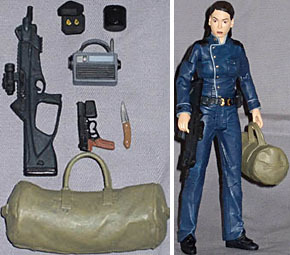 She also has a handheld radio, a jewellery box containing rank insignia (I think), and a little open-ended cylinder that might be a cup or something. If you've seen the movie, you probably know what it is. And sadly not to carry all that in, since it's solid, she has a duffle bag, which looks very authentic, but is a bit hampered by Kendra's recessed shoulder joints - it means there's very little space between her bicep and torso, leaving nowhere for the bag's strap to go if it's looped over her shoulder, unless you move her arm out sideways. That's one of a couple of minor flaws I've touched on, but overall I'm very pleased with this figure. I don't forgive her anything because of affection for the character, but her technical quality alone makes me quite fond of her.